we meet again! i know we go through this every twelve months, but it's about that time of year when the northeast-Ohioan in me starts craving the finer things of Fall....that chill in the air, the reds and oranges and yellows showing up on all the trees, pumpkin pumpkin pumpkin, and sweater weather, to name a few. 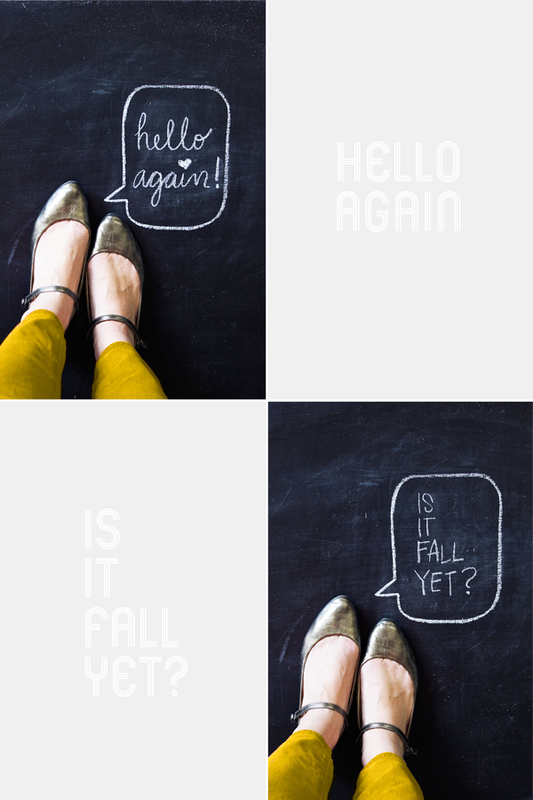 i'm sure you think it's super annoying that i ask you the same question every single day (is it Fall yet?! ), but this 90-degree weather is really throwing me for a loop. hope you don't take it too personal though. we both know i will have long forgotten about all this come January, when the days are warm & sunny and feel like springtime. i can't have it all, i guess! anyways, just wanted to let you know i'm ready for Fall to get here pronto. looking forward to hearing back from you. **it's actually been a little cloudy the past day or two, but 90-degrees is in the forecast for this weekend, and plus i just love talking about the weather? hope you all are having better luck with your september than i am. ;) i've even started making plans for a trip out to Virginia next month--to visit my sisters and get my fill of "Fall" (no offense southern California. remember what i said about January?). that craving i mentioned earlier is not kidding around!